While I don’t normally like sweetness in my savoury dishes, the vinegar makes it much more of a sweet-n-sour combination, which I love! It was perfect with some simple broccoli and rice, an easy to prepare, quick, weeknight dinner. 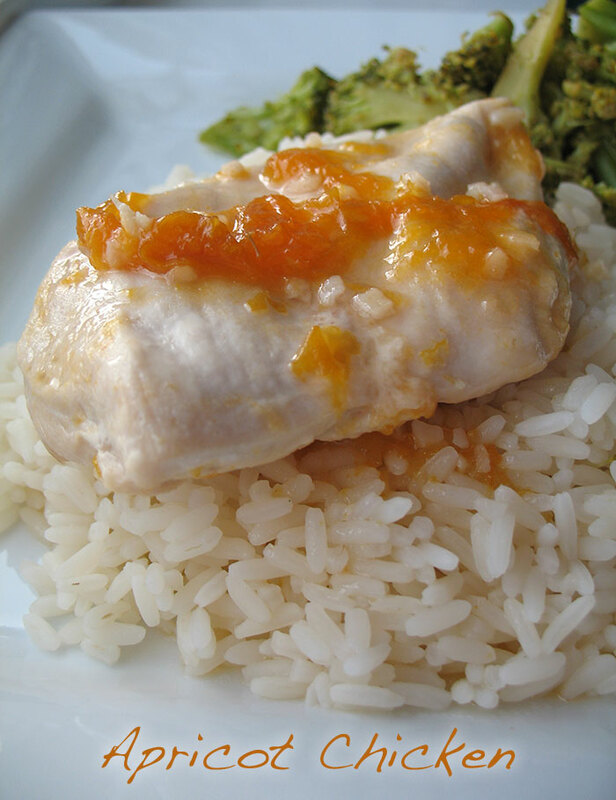 I made some small adaptions to the original, see the unadulterated Apricot Chicken recipe. 4 tablespoons of apricot conserve, the original recipe uses 3 but I think it could do with a touch more. Mix all ingredients but the chicken in a bowl. Leave aside. Preheat the oven to 180oC. In a oven proof frying pan (or my case cast iron casserole dish with lid) add just enough cooking spray to the bottom of the pan. Under a medium heat place each chicken breast in the pan, as flat as you can make it. Gently move the chicken pieces around the pan, but don’t flip them. Once they are cooked more than half the way through, you should be able to tell as they start to go opaque and white rather than remaining pink, pour the apricot glaze on top. Place the lid on the casserole dish or pan and put it in the oven for around 10 minutes, or till cooked through, the benefit of not flipping the chicken comes now – as you know when the top turns white it has cooked from the bottom all the way through. (However I still always slice through the chicken – just to check). Serve with rice and broccoli and the wonderful left over glaze. By putting the lid on, to ensure the sauce didn’t get burnt on to the pan and that the chicken cooked through quickly, my chicken ended up a tad on the anaemic side. It might have browned a bit better and the sauce gone sticker without the lid. Next time I’ll probably take the lid off for the last 5 minutes. Sometimes you just gotta try something to see how it pans out.